Take a look at these previews from the "B Safe Be Cool" suite! Above: Sneak peek of "B Safe Be Cool"
"B Safe Be Cool" is an interactive series of sixteen entertaining yet hard hitting animated scenarios, each designed to promote lively discussion with a young audience (9-11 year olds). It also features "Frankie's Film" - the true life tale of a real accident including actual CCTV scenes of the impact itself and interviews with the lucky survivor. The response from young students is always a shock and prompts engaging questions! 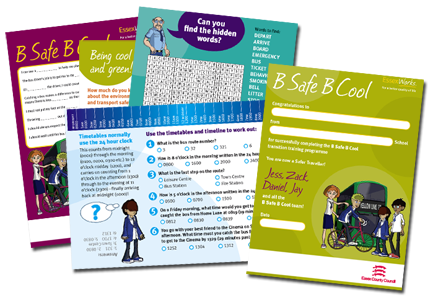 Above: Sneak peek of 'Zackly Right"
"Get it 'Zackly Right" is designed to help reassure younger students who may be catching a minibus, coach or taxi to school for the first time on their own. It features the B Safe B Cool cartoon characters and a group of pupils talking about their experiences of travelling. Above: Sneak peek of "Bus Bullies"
"Bus Bullies" is theatre based transition training. It is performed by ARC Theatre on a real bus with an audience of year 6 students. It combines the power of live theatre with a strong interactive dimension, bringing to life the story of Year 7 student Daniel and his would-be bullies, Jess and Jay. The play is designed to stimulate discussion and empathy around bullying, its consequences and effects and what students can do about it. Above: Sneak peek of "Caught on Camera"
"Caught on Camera" recreates a number of lively student-related scenarios through the eyes of a bus CCTV system. It's designed to stimulate discussion about respect for others and the consequences of bullying or antisocial behaviour, whilst demonstrating just how effective CCTV is in showing what really happened, each and every time. The film includes perspectives from drivers, teachers and the police to bring reality to the dramatised scenarios. Furthermore, an information book, worksheets and quizzes are available for the students to complete and are available to order. At the end of the workshop, the students can also be given a personalised certificate for them to take home.